It was the week before Christmas and, like all cities in the Western world, Berlin was lit up, the air was cold and the mood festive. At the Christmas market near the Zoologischer Garten train station, people milled about shopping and enjoying themselves. A short distance away, a Pakistani man named Naved B sat in a park. Twenty-three years old, Naved lived at the old Berlin airport, which had been converted into a refugee centre. He had arrived by way of the Balkans, making it to Germany a year earlier, and was granted a temporary visa when no translator could be found for the dialect he spoke. His life would soon be altered forever. 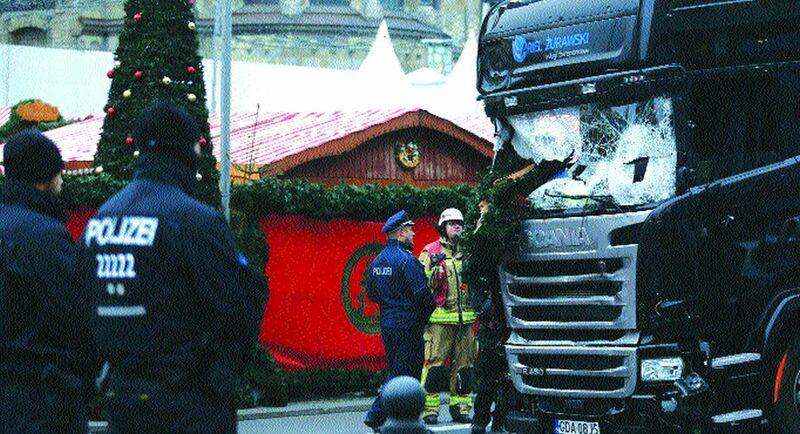 Around 8 pm, a semi-truck barged through the Christmas market nearby, crushing all those in its path. When the casualties were counted, 12, including the actual driver of the hijacked truck, were dead and nearly 48 injured. In the pandemonium that followed the attack, an eyewitness claimed to have seen the assailant, who had jumped from the truck and fled after it came to a stop, near a church. The eyewitness claimed that he saw the man, followed him and called the police. It was this call that led to the arrest of Naved B, who had at the time been hanging out around the Victory Column monument in the park. Within minutes, it had been conveyed to the media that the suspect in the gruesome attack was a Pakistani male. Everyone in the Western world, even those that argue for accepting refugees, could be seen shaking their heads. At the heart of all their consternation was an innocent man. It would take almost 24 hours for the Berlin police to finally admit that the brown, immigrant Muslim man they had apprehended was not the brown, immigrant Muslim man that had carried out the attack. The German newspaper Der Spiegel reported that the eyewitness on whose testimony the arrest had been made had actually lost sight of the attacker between the time he spotted him and then saw Naved B in the park. The police did not find gunpowder residue or blood on his clothes as they had expected to, given that the truck driver had been killed. It was over a day after the attack when they finally admitted that Naved B, the man they had arrested, was not the perpetrator of the attack, that the real culprit was still at large. The set of misunderstandings that led to the arrest of Naved B are not particularly surprising. Escalating xenophobia in the West, including Germany, has ensured that all brown men of any religion are considered suspect. In the logic of the terrified, there seem to be too many of them, dark and skulking in parks and around markets, representing always the threat of crime. There is little empathy for these men, or any appreciation as to how the festivities of others may sting and burn those who are far from home, from all that they have loved, and unwelcome where they are. In their desperation, they all seem the same. Punishing one man for the sins of another may be a gross inequity if the subjects are white and Western; it is perhaps less so when they are brown or black and desperate. It is probably because of this that the shooting death of the actual suspect, a Tunisian man named Anis Amri, 1,000 miles away in Italy is likely to have vindicated those who were quick to arrest and blame rather than underscore the caustic nature of the mistake. The disparities of Tunisian versus Pakistani, Arabic speaker versus Urdu or Balochi speaker, formally arrested versus detained, Arab versus South Asian, may all be facts but not determinative ones. There are only two of those: both were poor immigrants and both were Muslim. With the discovery of this, the two-pronged attack on the poor and the displaced, all the prejudices thriving in the West, were rendered justifiable. It was not one Muslim man, it was simply another. Naved B may have been an actual victim of mistaken identity in the minutes after the Berlin attack. Many more Muslim men, Pakistani and otherwise, are likely to pay the price for the actual perpetrator of the ghastly massacre. The highlighting of two aspects of identity, the Muslim faith and immigrant status as somehow special, worthy of notice and suspicion, means a heightened visibility — a presumption against that has to be proven otherwise at all times. They may not be terrorists yet, but they are all potential terrorists, men who will at some point blow up train stations, drive trucks into crowds of people, or blow themselves up. It is undoubtedly an onerous and unfair burden. Pakistani men applying for visas for study or work in any Western country will face the consequences of all the terrorist acts committed by Muslim men anywhere in the West. To end this cycle of collective punishment, they must work as vigorously as possible to stem the tide of intolerance and extremism in their own countries. Sadly, rejections by the West, whether they are in the languages of visas denied or for those that have managed to get there, arrests and suspicion, are likely to prevent them from doing just that. Anis Amri, the actual murderer, evaded capture and was shot to death before he could be apprehended. All the other Muslim men are, because of him and assassins like him, collective captives, guilty until proven innocent.